Plymouth is one of the most beautiful cities in the UK. Bursting at the seams with history, it is a pleasure to stroll around Plymouth. Here we present some ‘virtual’ tours that may give you a sense of some of the experiences that awaits visitors to Plymouth. Note – This tour of Plymouth only covers the city centre and the waterfront. There are many fascinating outlying areas in the city that are worth exploring, from the suburb of Stoke to Central Park with its extensive sports facilities. If you stand on Plymouth Hoe and look out to sea you will see yachts, speed boats, and pleasure cruisers enjoying the calm waters. Further out, beyond the breakwater, where the sea is more choppy, you will often see large grey naval ships sailing majestically across the Sound. One of the most striking features of Plymouth Sound is Drake’s Island. This island is not large and is quite close to Plymouth Hoe. In fact in the 1930s people were known to swim out to it from Plymouth Hoe. Used during the Second World War, it still has underground rooms and tunnels for the soldiers, and Drakes Island’s fortifications can be seen from Plymouth Hoe. Drake’s Island used to be owned by the council and it was possible some years ago to take a boat trip there and explore the underground areas. For a number of years however, the island has been privately owned and the public has been denied access to this fascinating landmark. 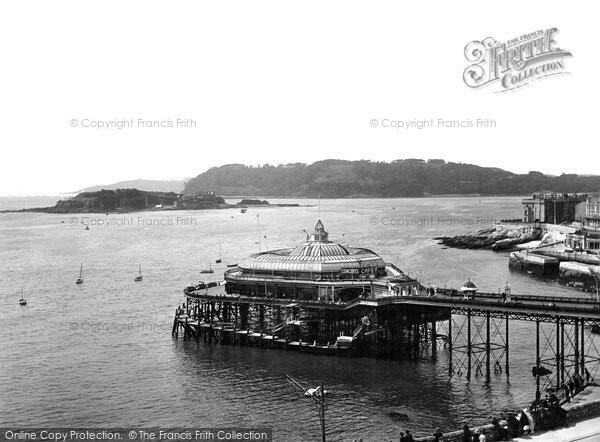 Interestingly, there used to be a pier on Plymouth Hoe until it was destroyed by bombs in the Second World War. As you approach Plymouth Hoe from Plymouth City Centre you are led naturally onto the wide sweep of the Promenade, where there is plenty of room for walkers to stroll and children to ride scooters or bikes. During the Second World War courting couples would dance here to music on summer evenings. The promenade gives onto a grassy expanse where you can sit and enjoy the spectacular sea views from the grass itself or on one of the many benches closer to the water. Arguably Plymouth’s best-known landmark, Smeaton’s Tower is the most prominent feature on Plymouth Hoe’s green belt. You can even buy prints of a famous photograph of the Beatles on Plymouth Hoe from Chris Robinson’s shop on Plymouth Barbican. With its bright red and white stripes it looks very much like a stick of candy. Recently restored to its previous glory, a low metal door gives onto a mysterious spiral staircase. As it ascends, small rooms are revealed at intervals, which were formerly occupied by the lighthouse keepers as living area, kitchen and bedroom. These are quite fascinating as they still contain items of furniture and objects used for every day living. At the very top is the pinnacle of the ascent, the lantern. Visitors can walk around the lantern and are close enough to touch it, and you can also peer down into the murky depths of the room below. A small balcony gives spectacular views over Plymouth Sound for those who have a head for heights. After leaving Smeaton’s Tower, as you move nearer to the sea, steps give onto Grand Hoe Road, and you can stroll along by iron railings, looking out to sea. Below the railings, more steps give onto some enclosed and some open walkways which descend right down to the sea at certain points. The most impressive sight at this point of Plymouth Hoe is Tinside Pool. An original 1930’s outdoor lido swimming pool. Recently restored, the pool is semi-circular and is separated from the sea by just a wall. This unique location makes swimming here a truly memorable experience. Near to the lido are pictures of the pool being enjoyed in the 1930’s. This gives a sense of the way in which the lido has been part of the Plymouth experience for many years. A real treat for any fans of 1930s elegant Art Deco architecture. It is easy to imagine it as the setting for one of Agatha Christie’s books – it takes little effort to visualise Hercule Poirot strolling beside Tinside Pool. Men's T-Shirts - up to 70% OFF quality t-shirts for everyday wear including designer t-shirts, slogan tees, band t-shirts, character t-shirts and more. Tough choices... shopping for clothes or hit the beach? Great news - you can do both with our online #discounts from top brands and local shops! It's always great to find a #bargain and you can find one every day with our specially sourced #discounts from major brands.